In the scope details view, you can see the details of each issue, as well as add scheduling dependencies to issues. Click the Scope tab to display the scope table. In the scope table, click an issue. The details view will display. Before you begin, make sure you have the link issues permission in your Jira instance. In the scope table, click the issue to which you want to add a scheduling dependency. Click + Add dependency, then specify the relation between the issues. 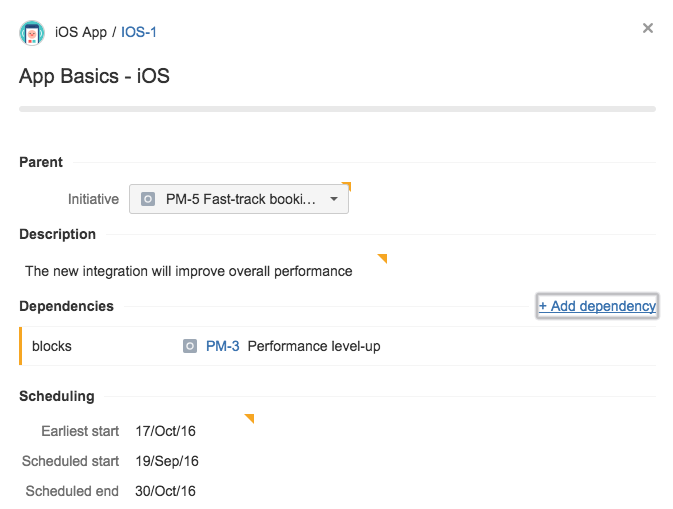 Commit the changes back to your Jira instance. 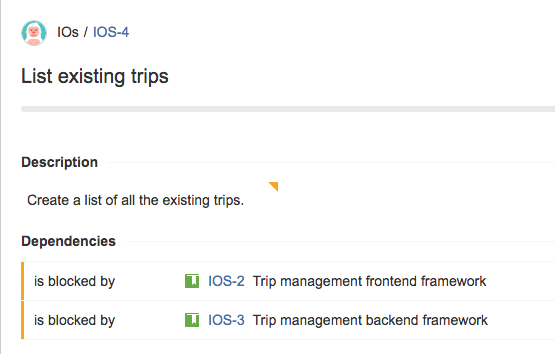 To illustrate, let's say you have an issue called List existing trips, and this issue depends on both the frontend framework and the backend framework being in place. You then need to add a dependency, so the frontend framework work must happen before listing the existing trips is implemented. Click the List existing trips issue. As a result, the List exisiting trips issue will then be scheduled after the frontend framework and backend framework issues.